As Kari Richardson said in her article in Chicago Tribune, child-friendly condo properties make city living for your little ones enjoyable and productive. 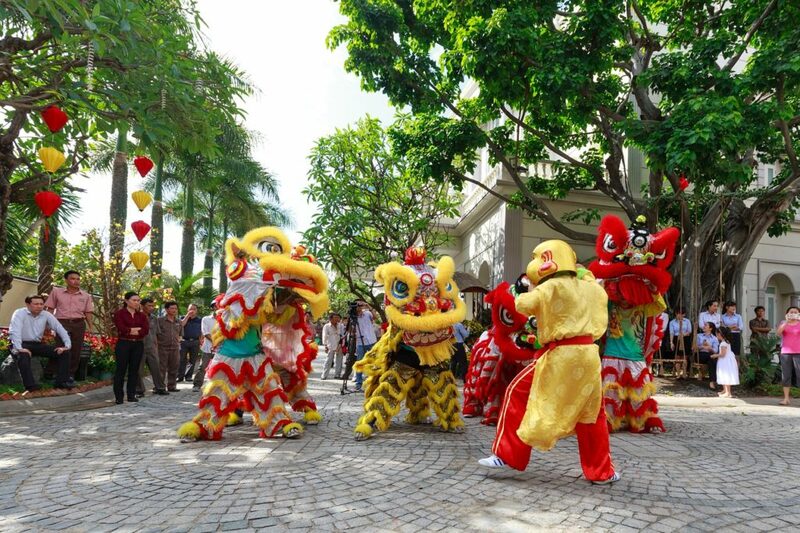 Undoubtedly, living in the city enables your kids to conveniently go to the movies, do some shopping, and eat at their favorite restaurants. 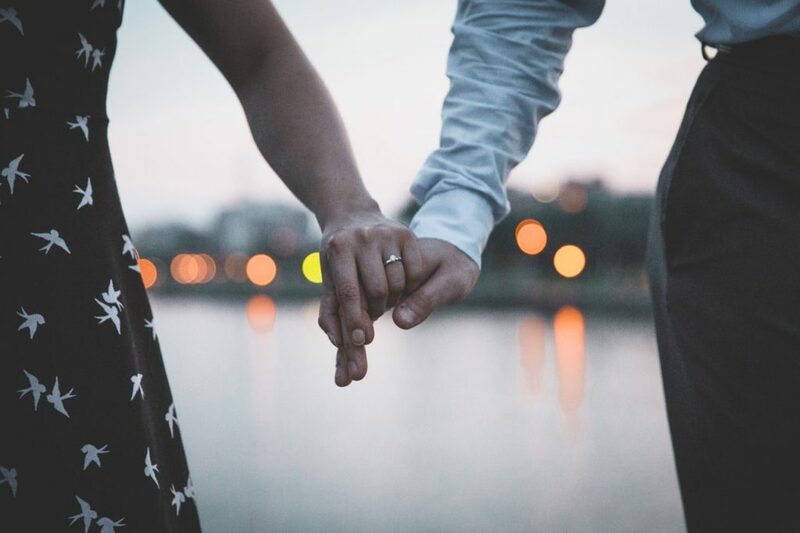 The rise of condo living in the Philippines gives families opportunities to indulge in the benefits that city life has to offer. Kids no longer get stuck at home with nothing to do. They can go to different places, do tons of things, and of course, meet lots of people while living in the city. After a busy day shopping or sightseeing, it is normal that your kids seek sanctuary in their bedrooms upon getting home in your condo. Don’t forget that young people have the insatiable desire for excitement and adventure. Catch your kids’ interest and attention. Keep your little bundles of joy active by coming up with fun ways to design your kids’ condo bedroom. Let your kids’ imagination come to life while staying dry in your condo. Let them take advantage of the opportunity of staying indoors. Your kids can find ways to kill rainy day boredom in your condo by making their favorite fairy tale story come to life. Set up their bed in an indoor fort inside their room. They can take a nap inside the fort and re-enact “Alice in Wonderland,” to keep them busy while awake. Set up a realistic-looking nature-themed environment in your children’s room complete with rabbit holes, as depicted in the story. Before you know it, your little ones would have already survived a rainy day keeping them busy, reliving their all-time favorite story. Maximize the space when raising your kid in a condo. 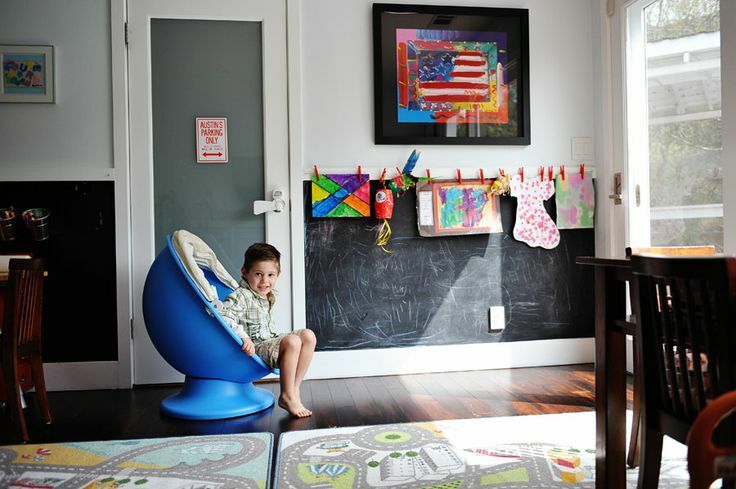 Allotting a space for play in your kids’ room should not be a problem in a tiny living space. 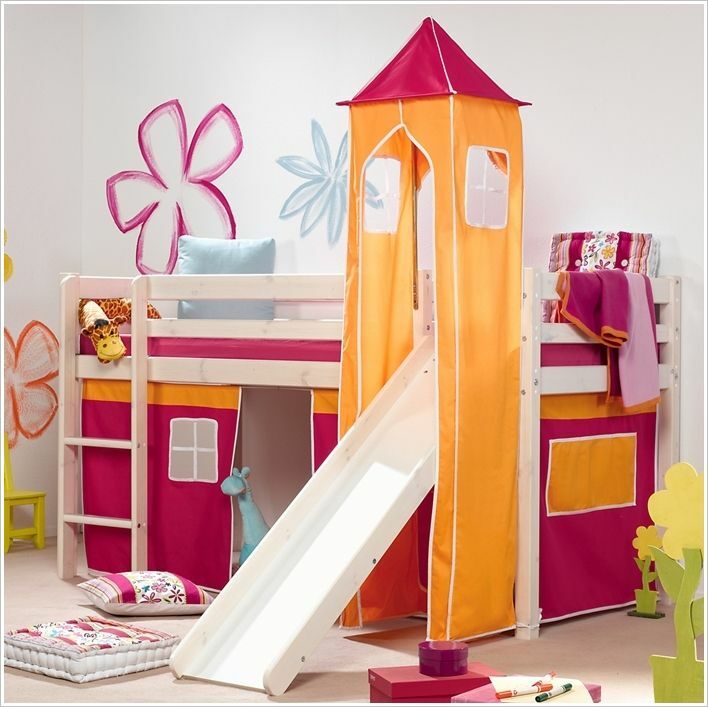 Let a play structure summer cottage hold your kids’ twin beds and other bedroom essentials such as stuffed toys, books, and miniature displays. A good night’s sleep follows an enjoyable play time. Take the opportunity to give your children time to role play being a mom and a dad. Allow your little girls and boys to play house in their own make-believe summer cottage conveniently before going to bed at night. 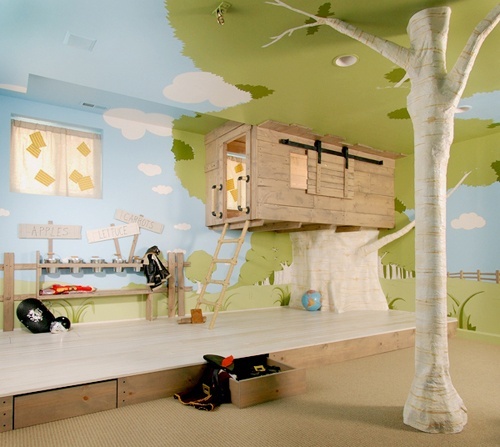 Choose a non-traditional amazing room design for your kids. If you’re caring for small babies in your condo, you may want to upgrade to using a modern and creative crib, instead of opting to use a classic one. Ingeniously use a customized design round cushion as a crib for your newborn babies. Adorn it with pillows to complete the set-up. Place indoor plants in your newborns’ room to let your little ones breathe excellent air quality for better health. Make your kids’ room design fit for games. Connect your kids’ room to your attic if you live in a larger condo space. Construct your attic in the form of a ship. Your kids can climb the ladder leading to the ship when they want to play pirate games. The ship attic will never fail to amuse your young ones during play time. 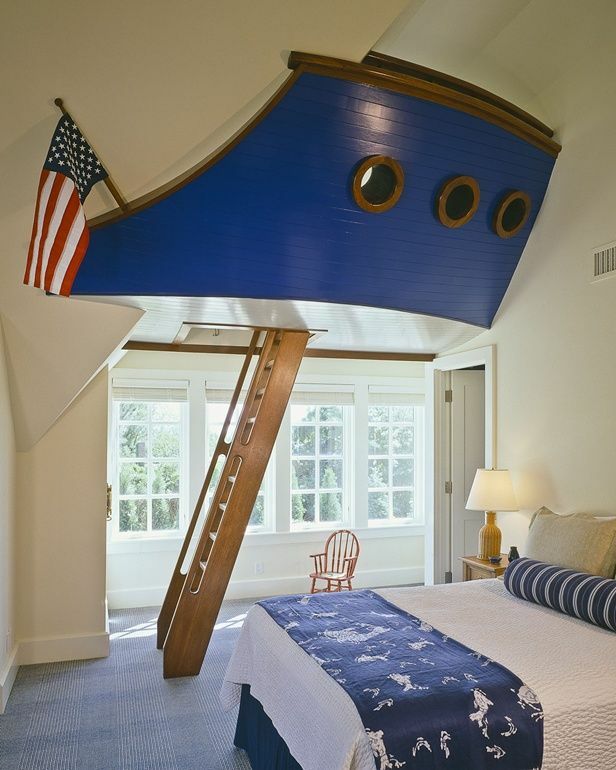 Having a pirate-themed bedroom should keep your children busy actively playing during their spare time when school is out. Your kids’ room interior design needs to match its essentials. 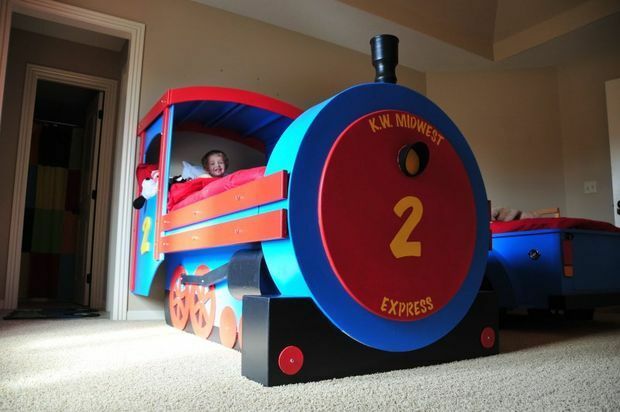 A bed in the form of a railway train should have your kids creatively make believe they’re having a great time in their favorite theme park. Your kids won’t need to constantly miss getting on a “Thomas and Friends” train ride. A seemingly real train ride is always available right at the comfort of their bedroom. 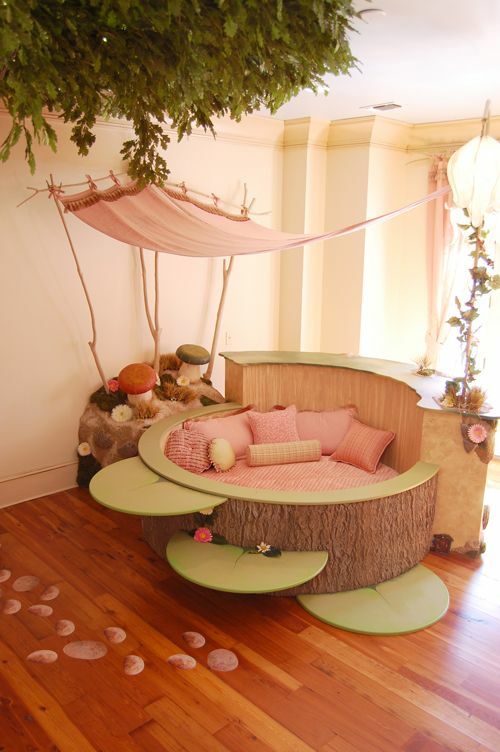 A tree house bed is the best place for young ones to play the roles of mother and child. Older children can play the roles of mother birds, while younger kids can pretend to be their children. Train kids to value responsibility by re-enacting the roles of mother birds protecting their offspring from danger. The bedroom is a great venue for shy children to play roles that produce valuable lessons. 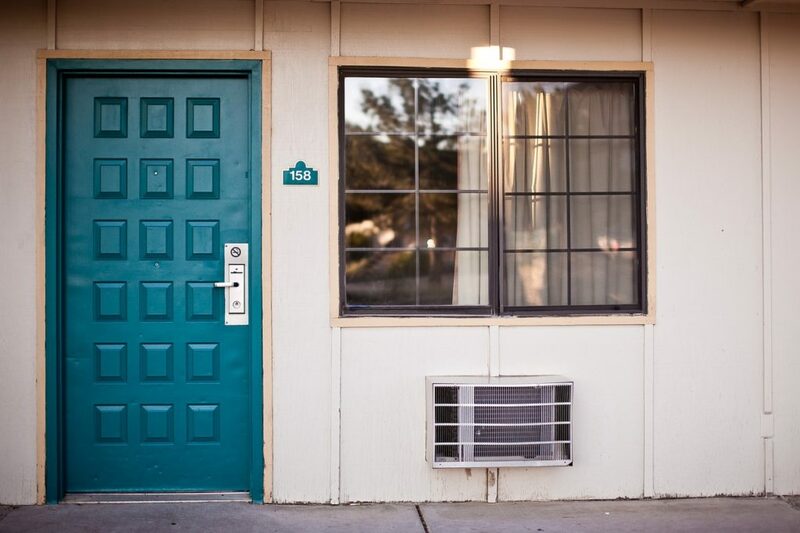 The bedroom’s privacy makes young people feel that there’s nothing wrong in committing mistakes. Bubble chairs complete the whimsical theme in your kids’ condo room design. To have ample space for these chairs, connect two of your children’s room with a sliding wall. Open the wall to form a single play space out of the two rooms. Place the bubble chairs on both ends of the connected bedrooms to produce a unified play environment. 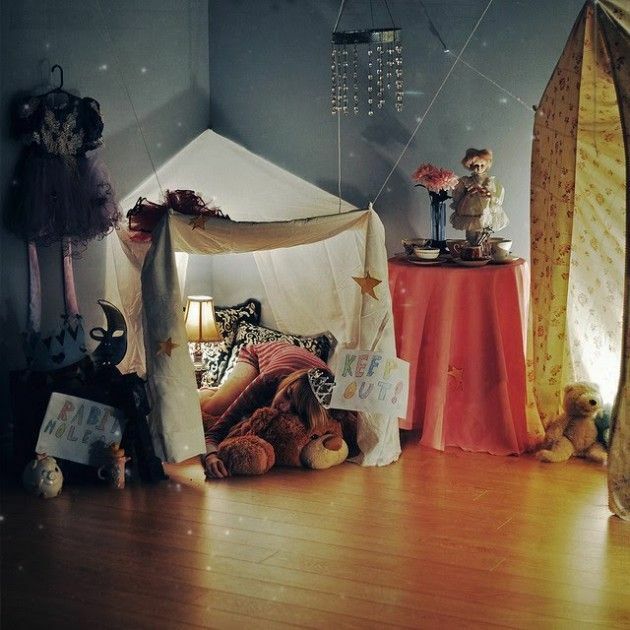 Your little ones may closely coordinate with each other playing fantasy-based characters such as fairies, angels, and nymphs in the connected rooms. Strengthen your kids’ self-identity by having them play supernatural roles. 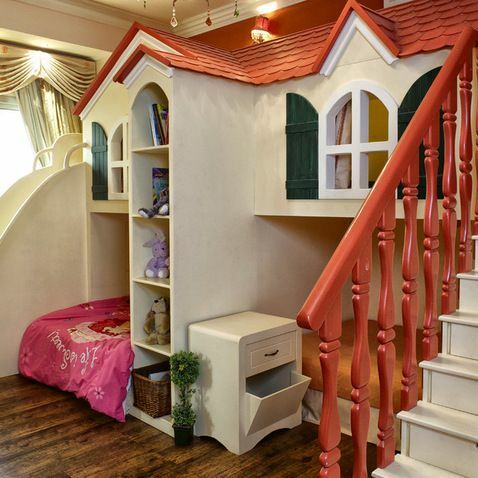 Feel free to relive your children’s other favorite fairy tales when you come up with kids’ room design ideas. Make your little girl feel more loved and treasured by treating her like a princess. 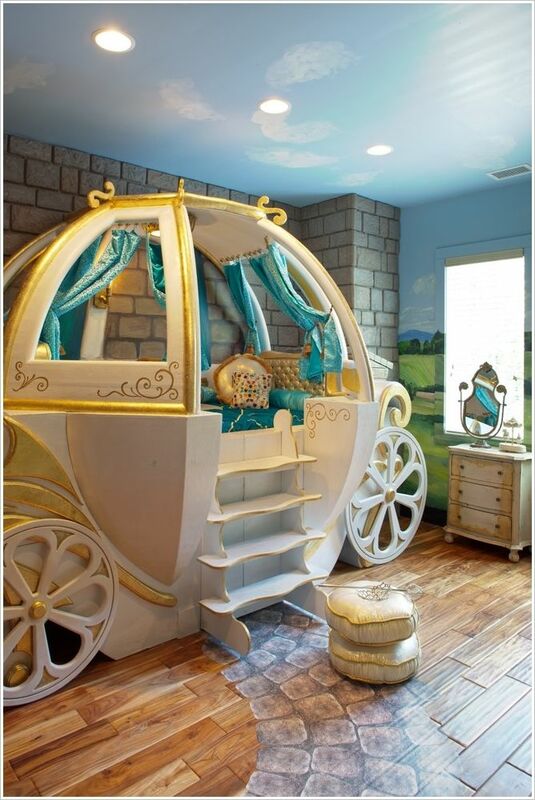 Have your princess feel Cinderella’s happily ever after in a carriage-structured bed. Put a magic wand from fairy godmother near the carriage to enchant your little girl even more. The list of condo room designs for kids is not limited here on earth. Have fun watching your little boy play the role of a spaceship captain. Contribute in growing his storehouse of knowledge by guiding your kid in operating the spaceship console play set. Your son’s brother, sister, or playmate can play the role of an astronaut navigating through space. 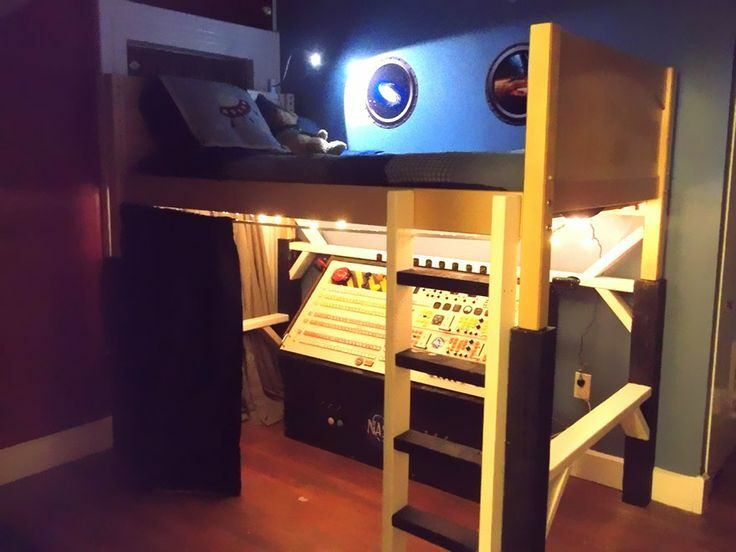 You can let your child’s playmate make-believe that he’s walking in outer space on the bunk bed above the spaceship console. Give your children the feel of independence in a caravan bed. Imagining they’re on a long trip before falling asleep at night will take your children’s wild imagination to the next level. Build a shelf complete with books inside the bed to enable your little ones enjoy their time “on the road”. Now your kids can have a playground right in their bedroom. You won’t have to worry about not having complete play sets in your backyard. Your small ones will have the time of their lives sliding from a tower attached to their bunk bed. Take caution, though, in supervising toddlers when they use the slide to avoid injuries. Gone are the days when you need to feel torn in choosing the best kids’ room paint design. Make the most out of your tiny condo space. Opt to have a separate chalkboard in your children’s room. Permit your children to write and draw on their room’s board walls using a chalk. Incorporate a school setting environment in the room by storing your kids’ stuff in school lockers, instead of cabinets and closets. Teach the important concepts of geography to your children without using educational materials. 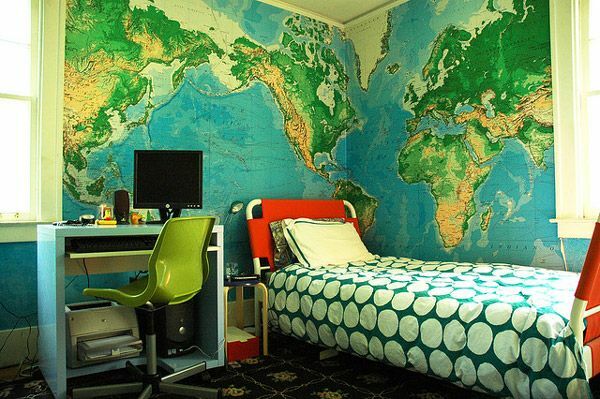 Design the walls of your kids’ room with a world map mural. Engage in interactive learning sessions with your smart kiddos, instead of letting them watch TV all day along. Feed them some extraordinary wisdom about the various continents in the world that they’re not aware of. Your kids need to let out their artistic side, too. They may just be nurturing a natural talent in acting without you even knowing it. 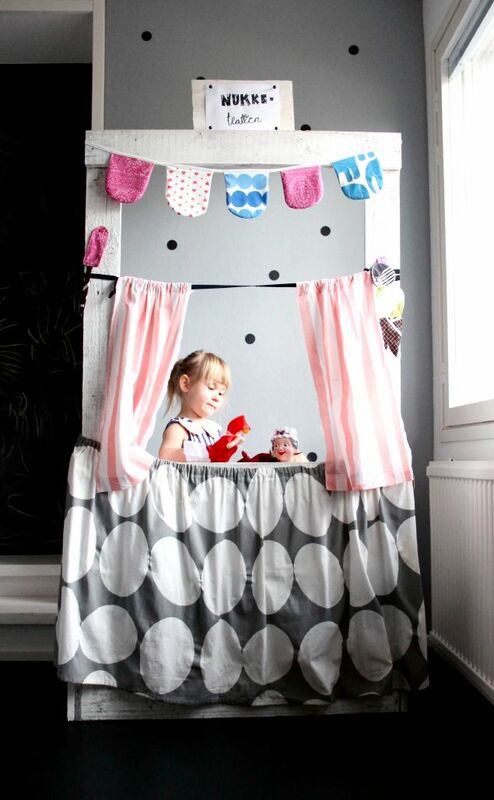 Watch your children act out a theatrical show in a puppet theater in their bedroom. Maximize the usefulness of your kids’ bunk bed by having the puppet theater above it. Kids will be amazed if they have a next generation bedroom. Having robots in a room will give young people a sneak peek on a futuristic lifestyle they may have never thought possible. The room’s gloomy stars and moon wall designs will instantly entice your children to get the good night’s sleep they need. Make condo living a milestone in your children’s lives. Design your kids’ own room customized according to their personality and character. Families raising kids in DMCI Homes will constantly find inspirations from these spectacular room designs.